It looks like Taylor Swift won't be going to Deerfield's senior prom this year! I hate to be the bearer of bad news, but Taylor Swift and Connor Kennedy have broken up. I'll probably be wearing black in mourning for the next month. Us Weekly broke the sad news. Supposedly, the distance was just too much between the inter-galatical superstar and the high school senior. 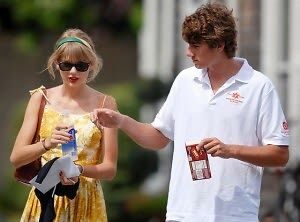 "They quietly parted ways a while ago," the friend explains of the "We Are Never Ever Getting Back Together" crooner, 22, and the high school senior, 18. "It was just a distance thing. No hard feelings. They're fine." It was certainly the romance of the summer. Remember those nights in Hyannis Port, sharing ice cream cones and going sailing? You could practically hear the wedding bells as they rode their bikes along the shore. Then school started again. The silver lining? There's another available Kennedy on the market and I am ready to pounce! Better news? She's probably already working on the song. What rhymes with Camelot, JFK, or American Royalty?